When is Liam Neeson going to be done proving that he's an action star? Since the success of 2008's Taken, the Irish actor, who is now 63-years old, has appeared in no less than seven action movies, including the recently released Taken 3. He'd taken part in action and adventure movies prior to 2008, but now it's not an exaggeration that we are getting the "Annual Liam Neeson 'One Man Army' Action Movie" every year. A Walk Among the Tombstones, which following Non-Stop marked Neeson's second action film of the year, is a bit of a departure from his usual formula, but it's not less violent. Does this change make the film worth seeing? Matthew Scudder (Liam Neeson) is a private detective who works in New York City. He was once with the NYPD, until the day when he shot three men who were robbing a bar and walked away from the job. Now, he spends his days going to AA meetings and looking for work. Scudder is contacted by Kenny Kristo (Dan Stevens), whose wife has been kidnapped and murdered. Scudder immediately deduces that Kristo is a drug-dealer, but he decides to take the case anyway. As he begins to investigate he notes that the kidnapping mirrors some others which have occurred in the area. The crimes concern the violent abduction of women who are linked to drug dealers. Scudder finds some clues, but not enough to put all of the pieces together. When the daughter of a drug kingpin is taken (?! ), Scudder sees his chance to intervene immediately and solve the case. 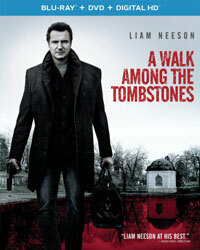 A Walk Among the Tombstones is based on a novel by Lawrence Block (the Scudder character previously appeared on-screen in 1986's 8 Millions Ways to Die), and the novel was adapted to the screen by Scott Frank, who also directed. Frank is known primarily as a writer, and he first gained my attention with 1991's Dead Again. Since then, he has done adaptations for several successful movies, including Out of Sight (for which he received an Oscar nomination), Get Shorty, and Minority Report. He made his directorial debut with 2007's dour but impressive The Lookout. The point of that little trip down Memory Lane is that Frank is someone who should know better, as A Walk Among the Tombstones is a terrible movie. For starters, it commits the worst sin that a film can -- it's dull. We watch Scudder walk around and talk to a lot of people and occasionally rough up some people, but for much of the film, very little happens. There is some action in the finale, but it's A) far too late, and B) done in such a way that we simply don't care anymore. After an action-packed opening, the movie settles down and it's clear that this isn't going to be another one of Neeson's mindless action movies. But, having very little happen is going too far in the other direction. The lack of action gets no help from the jumbled story. There is very little character development here, so everyone remains a stereotype. Whether or not Scudder is actually a private detective (or just an ex-cop vigilante) remains vague. Scudder meets a young man named TJ (Brian "Astro" Bradley), who sort of becomes his sidekick, but this character is underdeveloped as well. (There is a rumor that Ruth Wilson filmed several scenes as Scudder's partner, but these were ultimately cut. I believe this, as there as some odd edits in the film. Such as when Scudder talks to TJ about his gun at night, turns and walks away, and suddenly its daytime.) The movie really drops the ball with the finale. It remains unclear who the killers were or why they were doing what they did. A half-hearted explanation is given, but it's too vague. Frank can't be blamed for wanting to revive the hard-boiled detective noir genre, and using an entry from a successful line of novels seems like a good idea. But, A Walk Among the Tombstones is a mess which contains no suspense or intrigue. The only truly interesting moment was ruined by the trailer. To add insult to injury (no pun intended), the movie is also very mean-spirited, and I can tell you for a fact that women will find some of the content offensive. Maybe it's time for Liam Neeson to set his sights on conquering the world of comedies. A Walk Among the Tombstones shows Dan Stevens once again attempting to leave Downton Abbey behind him on Blu-ray Disc courtesy of Universal Studios Home Entertainment. The film has been letterboxed at 2.35:1 and the Disc contains an AVC 1080p HD transfer which runs at an average of 35 Mbps. The image is very sharp and clear, showing only a slight trace of grain and no defects from the source materials. Frank has gone for a deliberate washed out palette here, so we don't get a lot of bold colors, but the image is never overly dark or bright. The level of detail is very good, as is the depth. The Disc carries a DTS-HD Master Audio 5.1 track which runs at 48 kHz and an average of 4.0 Mbps. The track provides clear dialogue and sound effects. We are treated to excellent surround sound here, as the rear speakers produce individual, specific sounds which stand apart from the front and center channels. The stereo effects are good and are used in the finale to pinpoint off-screen sounds. The subwoofer gets involved during the action sequences. The A Walk Among the Tombstones Blu-ray Disc contains only two special features. "A Look Behind the Tombstones" (12 minutes) is a making-of featurette in which Scott Frank and Neeson share their views on the story and the characters, while the various producers chime in as well. We get a few moments of on-set footage here, but a lot of the piece is taken up by clips. "Matt Scudder: Private Eye" (6 minutes) has Author Lawrence Block discussing his creation and how the movie came about. There are comments from Frank and others who talk about the character and how he comes across in the film.